Mix all ingredients, except asparagus in a large Ziploc bag. Add asparagus. Place in fridge for 30 minutes. 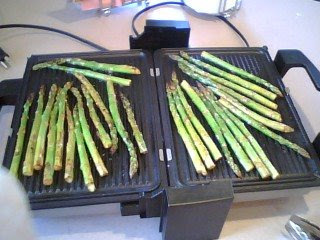 Coat a grill pan or broiler pan with cooking spray and cook asparagus for 5 minutes on each side. I have to say that I love my indoor grill pan. It can do so many things!